Originally the circus acts at Circus Circus performed right over the gaming pits. They were later restricted to a specific area of the resort because they distracted and annoyed serious gamblers, and not just that one time when people actually fell into the pit. Black and White photography has a timeless quality to it. It can take virtually any setting and make it striking, even somewhat iconic. Unique to its medium, it has the ability to quiet the visual noise color can bring to a photograph and instead draw focus to the spirit of the moment. Unique to Las Vegas, it doesn't do any of that. 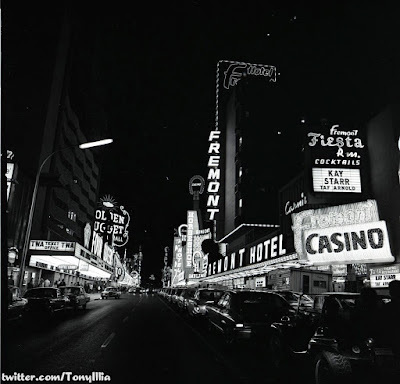 Black and White seems take the enormity of Vegas and its exterior majesty of lights and reduce it to a monochromatic view that, while still beautiful, could almost be mistaken for any bustling city in American in the 50s, almost. 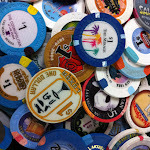 No place is this better showcased than on Fremont St and in this week's Twitpic of the week, shared by @TonyIllia. It's color, and the vast arrays of it, that intentionally overwhelm the senses and make Vegas an experience like no other. One of the few places in the world where you are reminded just how small and insignificant a single person is in the great scheme of all things while simultaneously giving you the feeling that you are a part of something much bigger than yourself. While your contribution to the collective whole may be little more than a pebble tossed into a lake, Vegas is the place you get to enjoy your ripple effect, regardless of how short its existence is.